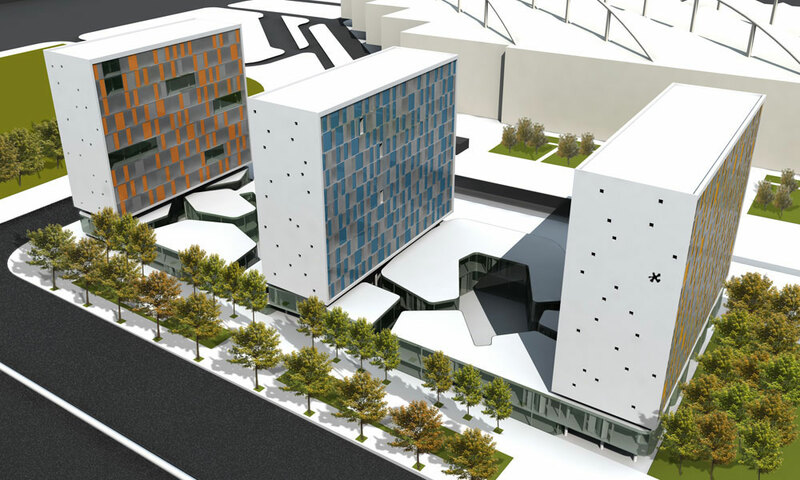 The project of the residential and office Complex, is located within a larger project that includes the area of Expo 2008. It focuses on the central square of the station like a real gate between the station designed by architect Carlos Ferrater and the city. The idea of joining these diverse urban elements is the guideline of the project in order to requalify the site as a new space of encounter, a new public space, and a living and commercial district. The basement recalling the urban historical texture of the city, merges the entire project, and is an organic succession of functions, such as the shopping center, the cultural and sport facilities. Its height is variable and uniformly distributed. It receives particular praise for its dynamic design which will create a sense of cohesion between the city’s existing urban identity and the new retail and recreational areas. In this way the mixed-use Complex will be able to create a new amusement and attraction place for different users. The fluid shape of the base contrast with the rigid vertical bodies of the residences and the offices; they have the same shape and height and their main facade follows a rhythm determined by full and empty. Through the integration of advanced technology facilities, advanced and innovative cover, addressed efficiency and energy saving, the building enjoys a significant capacity for self-energy production, as part of a more general attention to the architectural quality for the needs of the inhabitants and the whole context. From a methodology based on the progressive verification of the design choices through software simulation for the evaluation of the energy behavior of the building, the challenge is to make sustainability an element of recognition and quality of the project.